Fever is a condition in which body temperature is above the normal range. The upper limit for normal body temperature is approximately 38.3 degree Celsius. Fever is generally an indication of the immune system’s response to an infection. However, there could be other causes. Body temperature is controlled by a section of the brain named as the hypothalamus. Substances that cause fever- pyrogens cause the immune system to signal the hypothalamus to increase body temperature. This further leads to shivering as an effort to produce more heat and to conserve it so as to reach the new setpoint. When body temperature returns to normal the individual feels hot and begins to sweat. Infection: Bacterial, viral or parasitic infections such as malaria, typhoid, urinary tract infections, common cold etc. Fever is generally treated with antipyretics such as paracetamol or ibuprofen. However, in case of prolonged illness and constant episodes of fever, the underlying cause should be treated. Fever can also be controlled and rectified by herbal remedies which would be less harmful to the system in comparison to over the counter available drugs. Turmeric is one of the most adored spices in the culinary industry. However, it is more than just a spice. It has various therapeutic properties which makes it the ‘Golden Goddess’ of Ayurveda. 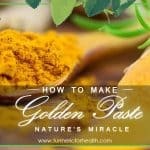 Turmeric has a bitter peppery flavor with a warm yellowish gold hue. It is native to India and Asia where it consumed daily as a part of the diet. 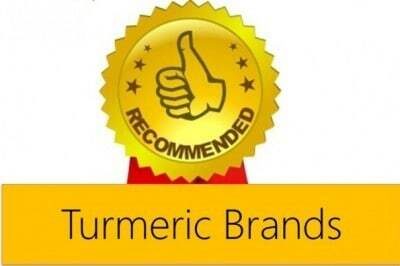 Curcuminoids is a class of compounds found in turmeric powder that impart the yellow color. They are natural antioxidants. 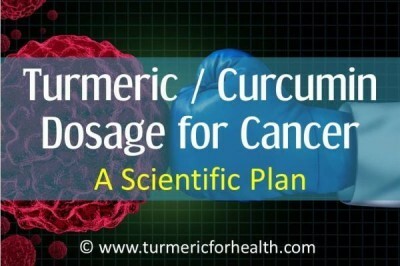 Curcumin is the active agent of curcuminoids that displays the most potent pharmacological properties. Turmeric serves as an anti-inflammatory agent, antioxidant, anti-microbial agent and anti-cancer drug. One of the Sanskrit names for turmeric is jawarantika – one which cures fever. 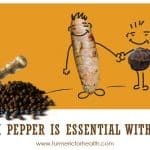 How turmeric can help control fever is reflected in the following studies and research articles. Fever is clinical evidence of inflammation. In case of infection, elevated blood counts are observed which release inflammatory mediators in the bloodstream to destroy the foreign body. The dying white blood cells release endogenous pyrogens which in turn cause the hypothalamus to regulate body temperature. Non-steroidal anti-inflammatory drugs such as paracetmol are the main line of treatment. However, NSAIDS pose side effects such as gastro-intestinal damage, increased clotting risk, increased risk of stroke and heart attacks, kidney failure, etc. 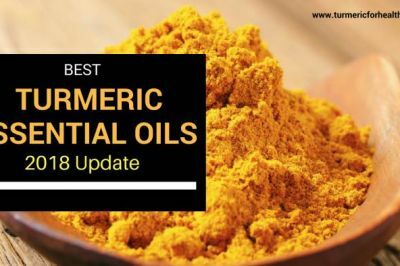 Turmeric serves as a natural anti-inflammatory agent which acts in a similar manner as NSAIDS but does not cause any side effects. 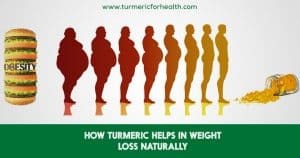 Curcumin is turmeric’s principle component that exhibits this activity. 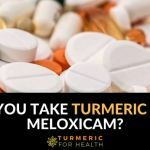 Curcumin’s anti-inflammatory and analgesic activity has proven to be safe in six human clinical trials and it is also proposed as a safer alternative to NSAIDS. Inflammation is one of the common causes of fever. 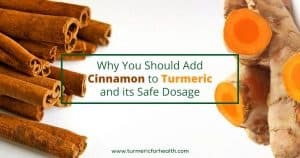 Curcumin and turmeric act in a similar way as NSAIDs to reduce fever. 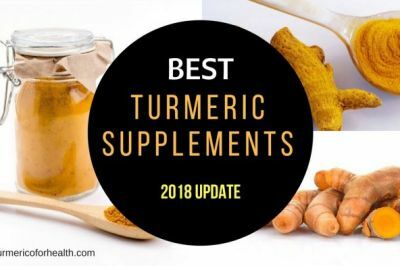 Curcumin serves as an immunomodulatory agent – it can alter immune responses. 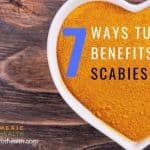 In case of inflammation or infection, it can boost the immune system and support the release of inflammatory mediators to destroy the infection. 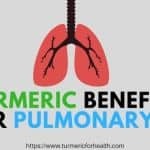 However, in case of allergies or autoimmune diseases, curcumin can curb the heightened response of the immune system and control the allergy and related symptoms. 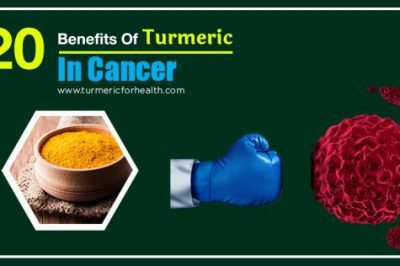 Both of these conditions are likely to cause a fever wherein turmeric can aid to control it as well as help the immune system to combat the disease. 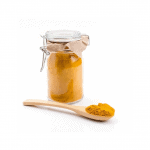 Turmeric modulates immunity in order to help reduce fever. Staphylococcus aureus is a bacterium that can cause skin infection and food poisoning. Fever caused by this infection leads to the release of inflammatory mediators such as interferon (IFN), tumor necrosis factor (TNF), interleukin-1 (IL-1), IL-2, and IL-6. A study was conducted to investigate the effect of curcumin on fever induced by this infection. Elevated levels of pro-inflammatory agents were seen in an active infection. Nuclear factor-kappaB, a group of proteins that control the inflammatory process and immune responses, is active during this infection. Curcumin was found to inhibit the activity of nuclear factor-kappa B and also reduce the levels of inflammatory mediators. It also reduced the fever caused by the infection. Lipopolysaccharide is a substance present in a bacterial cell wall that triggers fever. It is an exogenous pyrogen. Similar to S.aureus infection, it leads to increased release of inflammatory mediators. Study conducted in Taiwan proves curcumin’s anti-pyretic effect against LPS induced fever. Curcumin was found to reduce the levels of pro-inflammatory substances in rabbit blood and it also reduced the fever associated with the infection. Turmeric’s anti-microbial properties destroy infections that could cause fever. Every Indian household has made use of turmeric to treat some disorder the most common one being a fever. 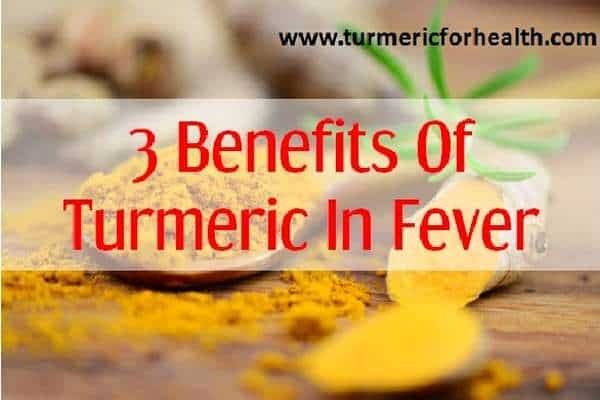 Here are a few ways turmeric can be consumed to cure fever. Drinking hot milk at night with ½ teaspoon turmeric powder added to it can control fever. 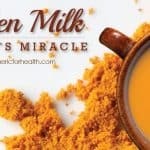 Turmeric milk can be made more appetizing by adding a few more spices. Heat 1 cup of milk with ½ teaspoon turmeric powder, 2-3 black peppercorns, 2-3 cardamom pods and ½ inch chopped ginger. Add sweetener for taste and relish this hot brew while it combats the fever. Ginger can complement turmeric in warding off symptoms associated with cold and fever. 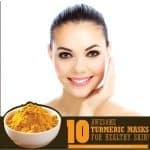 Boil 1 cup of water and to it add ¼ teaspoon of raw grated turmeric, ¼ teaspoon of grated ginger, ¼ teaspoon black pepper powder. Strain the mixture and let it cool. Add honey to taste. 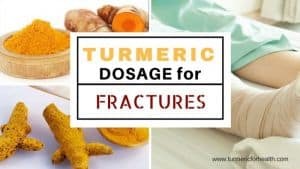 A simple remedy incorporating turmeric is turmeric tea. Add ½ teaspoon turmeric powder to boiling water, let steep for 5 minutes. Add honey or sugar to taste. Serve warm or at room temperature. 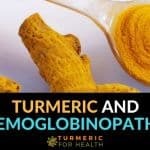 Other excellent remedies involving turmeric to combat fever include Golden Milk and Turmeric Tea. 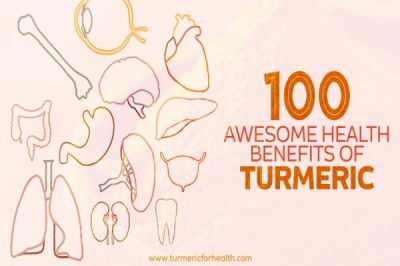 You can consume Golden Milk once a day and Turmeric tea 1-2 times a day. 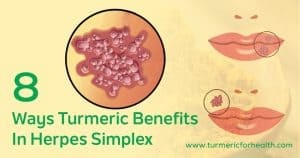 Turmeric is a simple natural remedy that you can use to reduce fever. It can also boost immunity and also aid in fighting infections or other root causes behind fever. Can this be given to a 16 months old baby who has a mild fever? Yes spices are permitted in diet for a 16 month old. We would recommend Turmeric Milk. Start with small doses to rule out chances of allergy, say 10ml. If it suits a dose of 25-30ml would do, increase gradually. 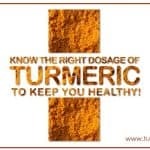 Also ensure that you use good quality organic turmeric powder.